Sander "Sandy" Levin (born in Detroit, Wayne County, MI, September 6, 1931) is a Democratic member of the United States House of Representatives, representing the 12th district of Michigan. Sander is the brother of Carl Levin, and father of Andy Levin. Graduated from Central High School, Detroit, Mich.; B.A., University of Chicago, Chicago, Ill., 1952; M.A., Columbia University, New York, N.Y., 1954; LL.B., Harvard University, Cambridge, Mass., 1957; lawyer, private practice. 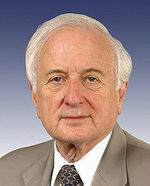 Sander Levin is the Chairman on the House Ways and Means Committee. He has served on every Ways and Means Subcommittee (Social Security, Health Care, Income Security and Family Support, Trade) except for the Oversight and Select Revenue Subcommittees. Member of the Michigan state senate, 1965-1970; unsuccessful candidate for Governor of Michigan, 1970 and 1974; assistant administrator, Agency for International Development, 1977-1981; delegate, Democratic National Conventions, 1964 and 1968; elected as a Democrat to the Ninety-eighth and to the fourteen succeeding Congresses (January 3, 1983-present); chair, Committee on Ways and Means (One Hundred Eleventh Congress). “The Council’s work in the state of Michigan and across the nation is always appreciated.”-Rep. Sander M. Levin (D-Mich.) (September 2014) . The SEIU PAC has contributed in excess of $65,950 to Sander Levin's campaigns. The Alliance for Retired Americans Political Action Fund endorsed Sander Levin in 2014, also 2012. This page was last modified on 15 July 2018, at 18:10.